Get Free MTN 4GB worth Of data - Download Unlimited With Mtn. Homemtn tweakGet Free MTN 4GB worth Of data - Download Unlimited With Mtn. The first GSM network to make a call in Nigeria - MTN, wants to start this year with a gift. MTN is giving out a whooping 4GB of data for free to their patriotic subscribers. 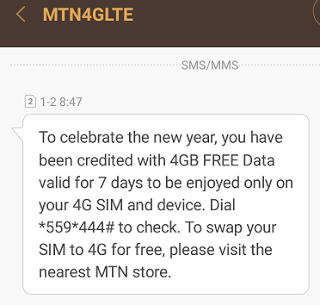 As reported through the SMS notification above, “to celebrate the new year, you have been credited with 4GB Free Data Valid for 7 days to be enjoyed only on 4G enabled devices". Simply dial *559*444# to check your free 4GB data. Don't forget to share your testimony via the comment box if you are part of the lucky people.